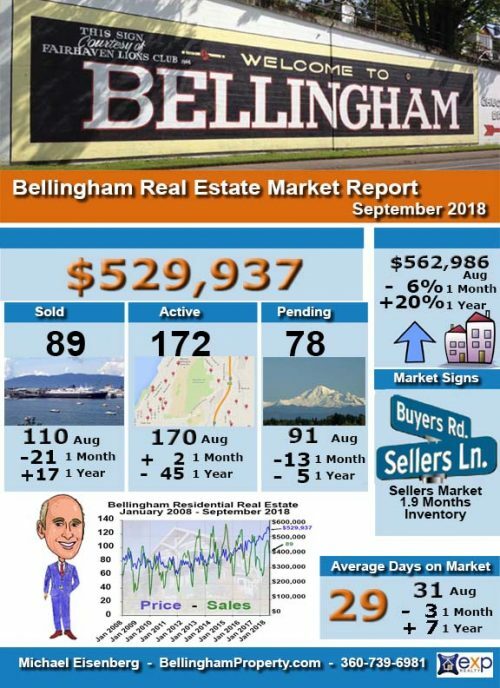 Here’s a quick look at the Bellingham Real Estate Market Report for September 2018 for residential home sales. 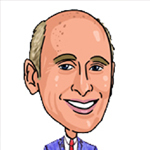 The number of residential sales for the month was 89 that is 17 more than September 2018 and 21 less than last month. The Average sales price of $529,937 is up 20% compared to last September and down 6% from last month. The number of homes for sales went up last month, there are now 1.9 months of inventory on the market, (if no new homes came on the market and sales rate was same as it is today, they would all be sold in 1.9 months). The number is still pretty small relative to years past. Inventory is finally climbing a bit again but still low at 172 homes for sale the day I write this. Any home priced right is still snapped up quickly often with multiple offers. There are only 7 homes on the market under $300,00 and as of today the least expensive home on the market is $190,000 for a small cabin the listing calls “tired and worn” on a waterfront Emerald Lake lot. This is making it extremely difficult for first-time buyers. 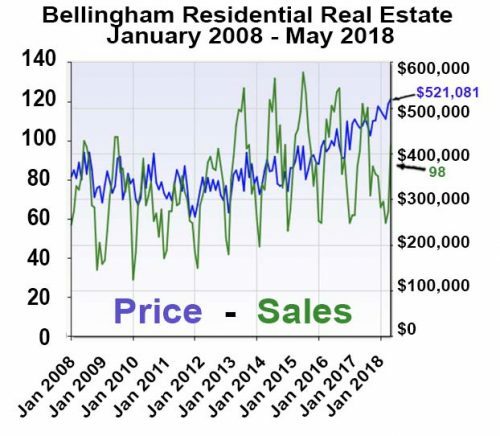 Bellingham and Whatcom County are reaching an unprecedented housing crisis and now is the time to have more important conversations and action about affordability, livability, and homelessness. Housing week partners and sponsors have a shared goal to increase opportunities for people of all income levels to have the opportunity to live in walkable neighborhoods that foster healthy lifestyles. Housing week provides education and awareness to empower advocates, and engage in dialogue about positive solutions. The week’s activities are free and designed for all stakeholders, including the general public, industry professionals, and civic leaders. With presentations from national experts, deep-dive workshops, and tours, Housing Week will highlight creative housing solutions for everyone. Events include a Downtown Housing Tour, Learning from The Vienna Model Exhibition, Zurich, and Other Advanced Places, Housing Solutions Bus Tour, The Housing Gap & The Economic Divide, Women’s Build and more. Here’s a quick look at the Bellingham Real Estate Market Report for August 2018 for residential home sales. 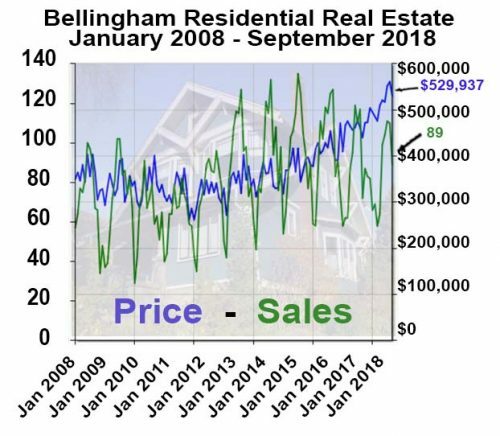 The number of residential sales for the month was 110 that is 7n less than August 2018 and 1 less than last month. The Average sales price of $562,986 is up 22% compared to last August and up 2% from last month. 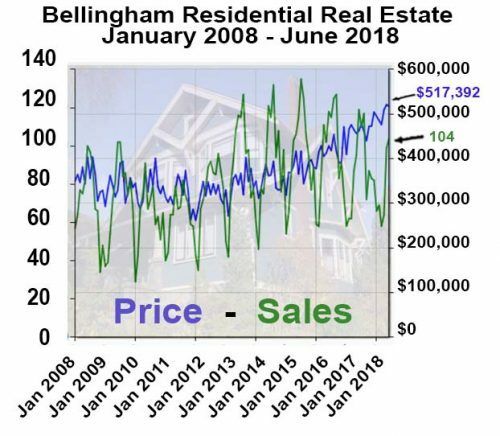 It is the highest average sales price in Bellingham to date. The number of homes for sales went up last month, there are now 1.6 months of inventory on the market, (if no new homes came on the market and sales rate was same as it is today, they would all be sold in 1.6 months). The number is still pretty small relative to years past. Inventory is finally climbing a bit again but still low at 175 homes for sale the day I write this. Any home priced right is still snapped up quickly often with multiple offers. There are only 9 homes on the market under $300,00 and as of today the least expensive home on the market is $134,000 for a fixer manufactured home on a small lot near Emerald Lake. This is making it extremely difficult for first-time buyers. 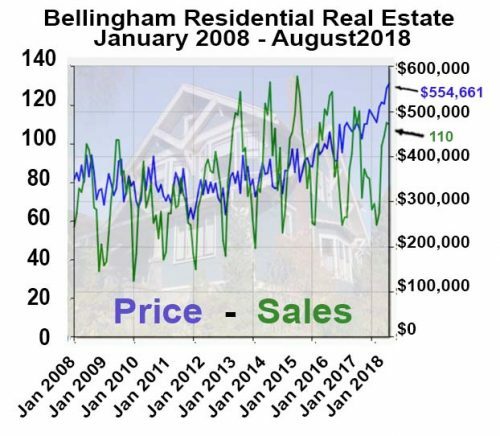 Here’s a quick look at the Bellingham Real Estate Market Report for July 2018 for residential home sales. The number of residential sales for the month was 110 that is 6 more than July 2017 and the same as last month. The Average sales price of $554,661 is up 16% compared to last July and up 7% from last month. 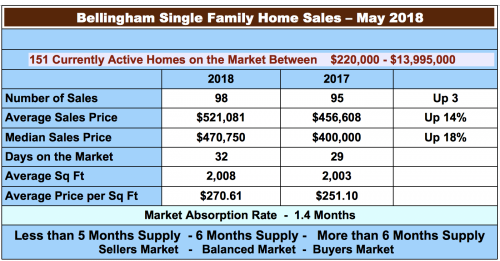 The number of homes for sales went up last month, there are now 1.4 months of inventory on the market, (if no new homes came on the market and sales rate was same as it is today, they would all be sold in 1.4 months). The number is still pretty small relative to years past. Inventory is finally climbing a bit again but still low at 153 homes for sale the day I write this. Any home priced right is still snapped up quickly often with multiple offers. 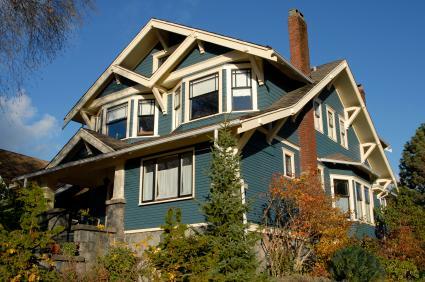 There are only 4 homes on the market under $300,00 and as of today the least expensive home on the market is $200,000. This is making it extremely difficult for first-time buyers. Multiple offers are still common in this market for any desirable home. 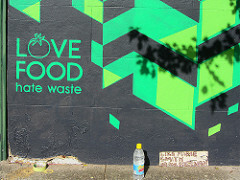 Throwing edible food in the trash or even the compost is not ideal — not for the environment, not for the community and not for the bottom line. One Bellingham organization has a solution. Sustainable Connections has started its food recovery program, where restaurants or other businesses can donate leftover already prepared food to feed hungry people in Whatcom County. Food waste is a huge problem in the America. The United States Department of Agriculture estimates that between 30-40 percent of the food produced in the US is wasted. In 2010, that translated to about 133 billion pounds of food becoming garbage — valued at $161 billion. Sustainable Connections, along with several local nonprofits, is trying to reduce Whatcom Counties portion of that number. Sustainable Connections has a grant from the state Department of Ecology for a new initiative called Squatch Food Waste, aimed at reducing the amount of food that’s thrown away. The Squatch Food Waste involves several programs for business and individuals: individuals can pledge to reduce the amount of food they throw away, and get tips, including smarter shopping, storing food better, using food scraps and, donating unwanted food. Restaurants always want to only buy the food they need, but that’s not easy. Restaurants can try and predict how many customers will show up on any night, and how many of those people will want the special or soup of the day or any other dish. 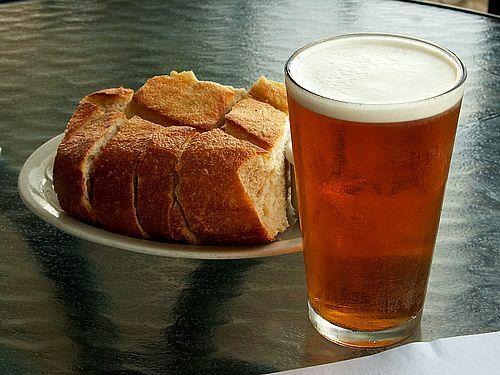 Most restaurants will have at least a few servings leftover at the end of the night. Combining these leftovers from many restaurants around town, that can add up to a lot of food for hungry people in need. Sustainable Connections and the Ferndale nonprofit Miracle Food Network volunteers pick up food up and distribute it to the organizations that feed people. They try to serve the food the same day it was picked up. More than 16 businesses have signed up for the food recovery program and hopes are more will join in. Any local business that makes prepared food can participate. Lighthouse Mission Ministries, Miracle Food Network, Northwest Youth Services, Ferndale Food Bank and Foothill Community Partnership are the nonprofit groups receiving the donated food at this time. Businesses get to deduct the cost of the donated leftover food instead of throwing it out helping their bottom line. 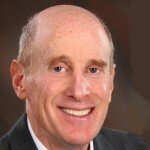 Businesses face little liability in the program, a federal law protects donors who, in good faith, give food to a legitimate non-profit organization. Boundary Bay Brewery has been in the program for more than two months. Restaurants on a regular pickup route can donate as little as five servings. The Mt. Baker Care Center, an assisted living facility, was the first business to sign onto the food recovery initiative. Volunteers from the program come to pick up the center’s leftovers right after dinner service. Hopefully, this service will expand here and nationwide. Here’s a quick look at the Bellingham Real Estate Market Report for June 2018 for residential home sales. The number of residential sales for the month was 104 that is 14 less than June 2017 and 6 more than last month. The Average sales price of $517,392 is up 11% compared to last June and down 1% from last month. 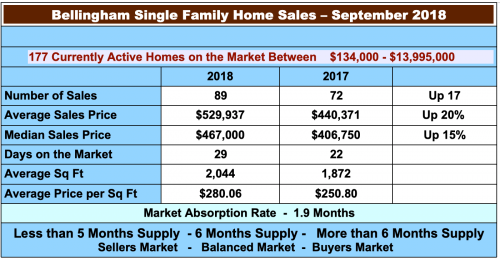 The number of homes for sales went up last month, there are now 1.5 months of inventory on the market, (if no new homes came on the market and sales rate was same as it is today, they would all be sold in 1.5 months). The number is still pretty small relative to years past. Inventory is finally climbing a bit again but still low at 153 homes for sale the day I write this. Any home priced right is still snapped up quickly often with multiple offers. There are only 2 homes on the market under $300,00 and as of today the least expensive home on the market is $138,000. This is making it extremely difficult for first-time buyers. Multiple offers are still very common in this market for any desirable home. Beer is BIG in Bellingham, I sometimes wonder which sells more, beer or coffee, my guess would be coffee but beer is probably not far behind. Net proceeds benefit Whatcom Beer and Wine Foundation’s beneficiary organizations: Our TreeHouse, Growing Alliances and Make.Shift Literacy Programs. BBQ dinner options are hamburgers or hot dogs with the works and chips. Vegetarian options available. Here’s a quick look at the Bellingham Real Estate Market Report for May 2018 for residential home sales. The number of residential sales for the month was 98 that is 3 more than May 2017 and 34 more than last month. The Average sales price of $521,081 is up 14% compared to last May and up 2% from last month. Inventory is finally climbing a bit again but still low at 155 homes for sale the day I write this. Any home priced right is still snapped up quickly often with multiple offers. There are only 9 homes on the market under $300,00 and as of today the least expensive home on the market is $220,000. This is making it extremely difficult for first-time buyers. Western Washington University’s Center for Economic and Business Research’s list of the top employers in Whatcom County for 2017 is avilable. The top 10 largest employers on the list are pretty much the same as they have been the past few years. In a community the size of Whatcom County, McCafferty, assistant director of the center said, it’s expected that hospitals, public schools, and local government would be on the top of the list. Not all companies are willing to disclose such information — and of the ones that are willing to participate, researchers just have to trust that the information provided is correct. This year ranking is by total headcount — a change from recent years, which looked at the number of full-time or full-time equivalent employees. 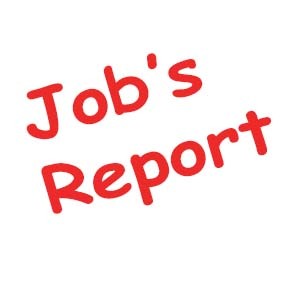 Employers with seasonal labor were more represented on the list this year. Maberry Packing, a Lynden berry grower went from 51st in 2016 to No. 8 in 2017. 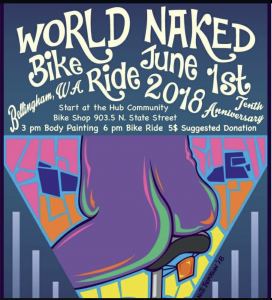 The 10th Annual “Bellingham World Naked Bike Ride” is happening on Friday, June 1 at around 6 p.m.
Police presence is provided to ensure public safety and event monitoring, just the same as it is for many public events. Police presence is not intended to be an endorsement of this event. Organizers say the route will be: South on S. Bay Trail from 903 N. State Street to Wharf Street then north on N. Forest to E. Holly Street. West on E. Holly to Bay/Prospect Street, then Flora to Central to N. Commercial. The ride continues back to Flora and then east on York Street to N. State Street. From there the route goes south to E. Champion turning west to Commercial Street then to E. Magnolia returning to N. State Street to travel to E. Maple Street. The ride then continues west to Cornwall Avenue then north to Flora. The final leg of the ride is south on Railroad Avenue from York Street concluding near the area of the Farmer’s Market in the 1100 block of Railroad Avenue. The monthly Downtown Art Walk, which is coordinated by Downtown Bellingham Partnership, is happening from 6 to 10 p.m. on the very same evening as the naked bike ride event. There are points along the naked bike ride route that will intersect with the Art Walk.